FRANKFURT (Bloomberg) -- Mercedes-Benz’s first mainstream electric car has Tesla technology under the hood, though Mercedes is not flaunting it. 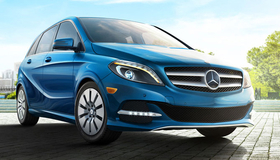 Unlike BMW, which wrapped its competing emissions-free model in futuristic carbon fiber, Daimler’s Mercedes unit put an electric motor and battery inside its existing vanlike B-class hatchback. The only clues that it’s electric are a couple of small decals and the blue trim on the mirrors and front grille. Teaming up with Tesla Motors is supposed to help Mercedes transfer some of the hipster aura of the electric-vehicle pioneer to the B class while avoiding the pitfalls of spending billions on a technology few may want to buy. Whether it will resonate with the consumers who do want to be part of the automotive avant garde is another question. “The B-class electric is a low-cost and low-risk solution for Daimler,” said Stefan Bratzel, director of the Center of Automotive Management at the University of Applied Sciences in Bergisch Gladbach, Germany. Because the electric B class shares an assembly line with the gasoline and diesel versions, Mercedes doesn’t need to sell a fixed amount of vehicles to cover its costs, Bratzel said. BMW counters that creating a new electric car has advantages over re-fitting existing models. “Weight, drivability and range are in ideal proportions,” said BMW spokesman Mathias Schmidt. Consumers will get to decide when the emissions-free B class reaches showrooms in Germany on Nov. 29. It comes with a range of about 200km (124 miles), at prices similar to the BMW i3, Zetsche said. The BMW car costs about 35,000 euros ($43,766) in Germany and $41,350 in the U.S., where a version of the electric B class has been available in selected states since mid-July. A broader rollout is set for next year. During the test drive, the white B class blended in among other compacts on the island’s windy asphalt roads. Though the car weighs about 200kg (440 pounds) more than the conventional gasoline and diesel B-Class because of the big battery pack, it accelerated swiftly, thanks to the instant power of the electric motor. It was almost silent, except for an artificial sound Mercedes added to warn pedestrians at speeds up to 30kph (19 mph). The center display continuously updated the car’s current range, charging level and energy flow. The battery and motor come from Tesla. Though Daimler loosened the relationship last month, selling its 4 percent stake for about $780 million, it says it will keep the startup as a supplier. For Daimler, this is the third battery-powered model after the e-Smart city car and an electric version of the Mercedes SLS supercar that’s now out of production. It has the best chance of winning buyers. BMW’s riskier strategy might eventually pay off. The i3 will probably outsell the electric B class two to one in 2020, according to estimates from IHS Automotive. And that’s only counting pure battery-powered vehicles. Orders with an on-board gasoline-powered generator to extend the range will propel i3 sales to 32,400 compared with 6,400 B classes, according to IHS. That may be because people who buy electric vehicles actually want other drivers to notice how environmentally conscious they are, said Anjan Hemanth Kumar, an analyst for Frost & Sullivan in Bangalore.